"My trip was definitely an unforgettable experience. To travel to India is to see and experience another world. " They travelled with Exoticca in May of 0018. 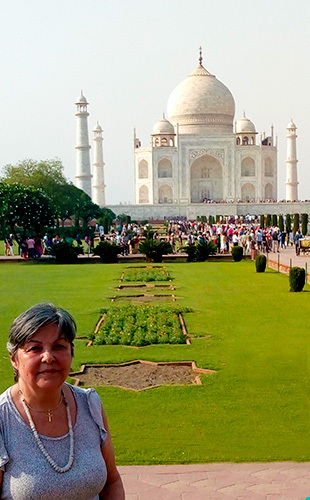 I am an artist and I feel a strong affinity with all things to do with spirituality, so India has always been a destination I have aimed to tick off of my bucket list. It is the spiritual capital of the world and stood out to me as an ancient and holy place so, as a Buddhist, it was excited to finally have the opportunity to visit this sacred land. I booked as a solo traveller and have done an extensive amount of travelling on my own in the past to places such as Asia, Africa, South America and Australia, among others. People ask me ‘how do you travel to all these places on your own’ and I always tell them ‘I just get up and do it!’ Exoticca’s colourful website, the way the holiday was presented and the reasonable single supplement all led me to book up for my Indian experience, and I looked forward to experiencing the land of a thousand colours and to relaxing in Goa after touring the sights of Rajasthan. 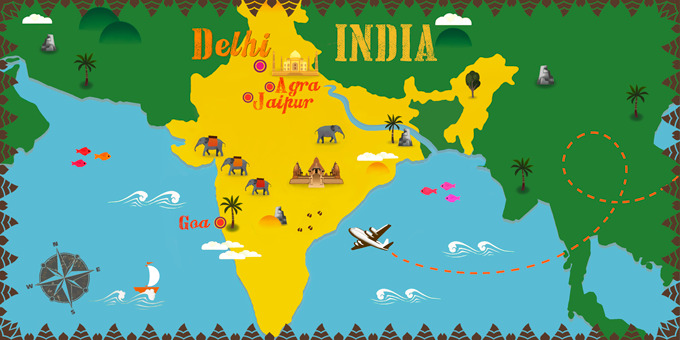 The tour would take us from Delhi to Jaipur and Agra, to see the varied sights and sounds of Rajasthan before flying to Goa to spend some time relaxing in a more tranquil and laid-back atmosphere. The traditional tourist spots, like the Taj Mahal and the Palace of the Winds, were amazing and the architecture was beautiful but I couldn’t help but wonder about the sad history behind some of the buildings and I also thought that is seemed unjust that there were so many homeless and poverty-stricken people in the streets, yet huge buildings like the Taj Mahal are left empty, like fossils of a majestic age. Despite this, I could feel the beautiful energy surrounding these places and I had a memorable time in Agra, where I took an elephant ride! Another joyful memory was transferred across the city of Jaipur during rush-hour. I have never seen such organised chaos in my life! The cars, motorbikes and various unidentifiable vehicles hurtled in all directions it was just unbelievable and a great, although crazy, thing to be a part of. Some of the group were shocked by this experience, but I loved every minute of it! The tour guides, who were knowledgeable, kind and educated people, informed me on a great deal of Indian history and explained so much about the culture of the country, it was a really eye-opening experience. Having been on many tours in the past, I knew that our guides were of a high quality. 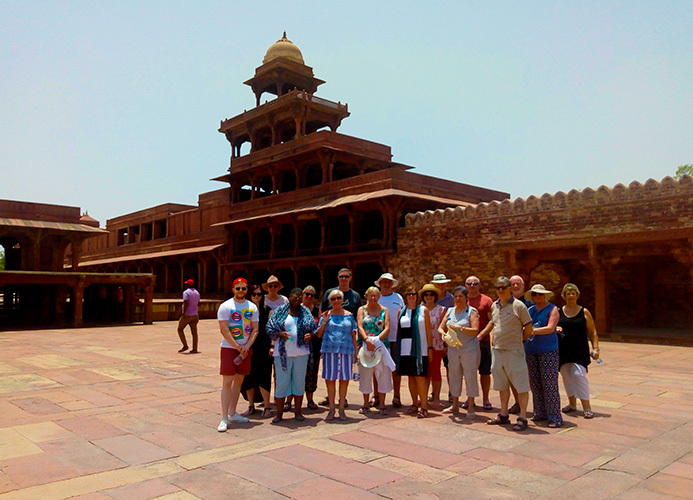 The organization of the excursions were extremely professional, with enough flexibility to make the tour enjoyable and timings were always kept punctually for pickups and drop-offs, so I could make the most of my time in India. The journeys between the destinations were a great opportunity to soak in the surroundings and to take time to think about all that we had seen. The most astounding thing about India, especially in the cities, is the difference in culture, society and living standards in comparison with the West. Arriving in Delhi it was a complete whirlwind. The pollution from the unceasing traffic, the bustling atmosphere and the exhausting pace of life were definitely different from what I expected. Many of the buildings in Delhi were a lot more modern than I had thought they would be, but I was glad to see that despite all the changes, the pollution and the unrelenting pace of life, the spirituality of the city still shone through to me and I could feel the positive and beautiful energy of the place. You cannot go to India and expect it to be easy or familiar because it is neither. The people, on the whole, are so generous with their kindness and don’t apologise for the way they are, which is a refreshing way to approach life. The guides and hotel staff treated me like friends and were always greeting me with their beautiful smiles. They were a pleasure to be around. The hotels throughout the trip were of a good quality, especially the ones in Delhi and Goa. The service was amazing and the staff were really great at helping you, be it with recommendations of where to go or what to see or just to chat to about your day. Every hotel had a refreshing swimming pool and I made a habit of enjoying a morning swim before breakfast every day. The traditional Indian food is a lot spicier than I thought it would be and not at all like the curries you can get back home. Thankfully, there was a lot of choice in the hotels and there were options for all tastes. Breakfast was really the highlight for me as there were always delicious fresh juices and a variety of bread to enjoy. After the busy touring part of the holiday, I was glad to relax in the abundant nature of Goa, and the hotel sat amongst mango groves and beautiful gardens. I spent the time in Goa completely relaxing at my own pace. The atmosphere was very different in Goa; it was much more laid back and calm. The swimming pool was absolutely stunning and I spent my days exploring the local sights, enjoying massages in the spa and just generally basking in the natural beauty of the environment. I often ate at the al a carte restaurant on site and enjoyed going into town and looking around the shops. I felt completely safe in Goa on my own, which is important to note as, sadly, in some of the Indian cities, you might not want to wander around on your own as a woman, without a group. The sea in Goa was delightfully wild and crystal clear and the beach was only a very short stroll away from the hotel grounds. It would have been nearly impossible to come away from India without buying something to take home and I absolutely fell in love with the beautiful cotton and linen clothes that I found in the markets and shopping centres, particularly in Goa. I came back with lots of scarves, hats and trousers along with intricate crochet items. I’ve enjoyed wearing them ever since I’ve been home! My trip was definitely an unforgettable experience. To travel to India is to see and experience another world. It was a spiritual experience for me. I am a big believer in getting out and doing things, even if they are not easy and I don’t want to remember my life as one where I am sat at home alone. I want to be on a plane travelling from happiness to happiness! Get to know a little bit about the culture and what to expect from the destination you are travelling before you go. That way you will be prepared and make the most of your experience. Many of the tour guides make most of their money from tips so be sure to respect their craft and tip well as they are such a big part of the experience when you take a tour. Ask the guides questions. This way you can get the best insights into the culture and history of the country and make the experience more relevant to you. Goa, which sits on the Arabian Sea, is often one of the most attractive places to visit for first-time travellers to India. It is a lot less crowded and polluted than some of the large Indian cities and is famed for being a spiritual haven, full of tranquil beaches and luxurious resorts.